The FBI said he called the Pittsburgh shooting 'a dry run for things to come.' But he was talking about a different attack. According to an NBC News analysis of social media posts, the claim that a Gab user had insider knowledge of the Pittsburgh synagogue shooting is incorrect. The FBI said it believed there was a connection between Clark and the shooting. In an affidavit, the bureau said it found a posting showing that Clark called the Pittsburgh attack “a dry run for things to come.” Clark, 30, was arrested on gun charges on Tuesday, and a federal complaint explored potential connections between Clark and Bowers on the social network Gab, where white supremacists have made a home in the last two years after being banned by more mainstream sites. But according to an NBC News analysis of Clark’s social media posts, the claim that Clark had insider knowledge of the shootings is incorrect. A look at Clark’s posting history shows that he was referring to a different alleged terrorist — the man accused of sending pipe bombs to Trump critics — and that Clark posted the comment about a “dry run” before the Pittsburgh shooting took place. Clark’s profile has been removed from Gab. The archives of his posts were viewed by NBC News via pushshift.io, a social media analysis tool operated by data scientist Jason Baumgartner. 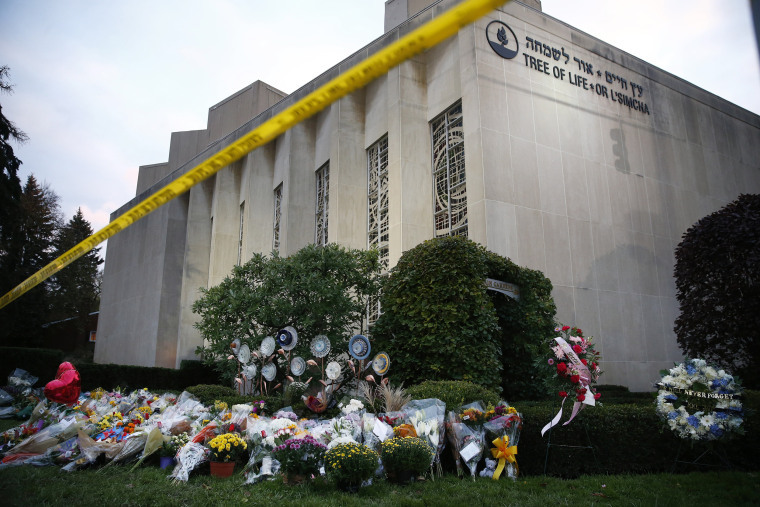 “This statement implies that Jeffery Clark did know more about the attack in the Tree-of-Life synagogue, and that there was more to come,” Bauknight wrote. But Clark made the post referred to in the FBI affidavit on Oct. 26, a day before the Pittsburgh shooting, NBC News found. In the post, Clark was replying to another Gab user complaining about Cesar Sayoc, the Florida man who allegedly mailed pipe bombs to prominent Democrats. “This Sayoc guy is a f---ing idiot. How tiresome. We have to get saddled with this s--- and blamed for it? F---ing hell,” user “Arthur Frayn” wrote. Clark replied by praising Sayoc as "based” and suggesting "libtards" get used to the violence. And the photo that the FBI claims Clark shared of Robert Bowers, splattered with blood, is actually an alt-right meme, which was posted on an article about the attempted pipe bombings on a popular neo-Nazi website one day before Clark’s post, and two days before Bowers’ shooting. In the meme, a bearded man in a fisherman’s hat is holding a gun. Along with splattered blood, the words, “They cut off our social security so we cut off their heads,” covers the main image and a stamp reading “Boomerwaffen Division” is fixed to the bottom, a portmanteau of a term for older Americans and the Atomwaffen Division, a national socialist terrorist organization. NBC News found the image through a reverse image search on the Russian search engine Yandex of Clark’s post, which was provided to NBC News by the U.S. Attorney’s office. During Clark’s hearing Tuesday, prosecutors acknowledged they were looking into questions about the FBI’s analysis of Clark’s posts in the charging documents. Clark’s lawyer, the FBI and the U.S. attorney’s office declined to comment. The Department of Justice did not immediately respond to a request for comment. Clark was charged on Tuesday with transporting a firearm across state lines and possession of illegal, high-capacity magazines. He was a prolific user of Gab, which briefly shut down in October after its web host and support services abandoned the site following reports that Bowers had posted anti-Semitic comments there before the shooting. Clark and Bowers both followed each other on the site, according to an archive of Bowers’ removed account, viewed by NBC News. They were among each other’s hundreds of followers, but a review of their thousands of posts shows no actual conversation between the two. Under the username @PureWhiteEvil, Clark posted over 3,700 times to Gab. Clark explained in August that he had moved to the site after multiple failed attempts to evade Twitter's ban on his neo-Nazi content. "I used to be DC Stormer, DC Death Squad, then DC Bowl Patrol (which preceeded BOWL GANG) before giving up on being able to stay on Twitter after which I retired here." On Gab, Clark idolized Dylann Roof, the man who shot and killed nine black people at a Charleston, South Carolina, church in 2015, and obsessed over "cultural marxism" and baseless conspiracies involving vast pedophelia rings. He also posted hate speech and threats, including over 60 calls to throw Jewish and black people, journalists and perceived political enemies "feet first into a woodchipper." Following the Pittsburgh shootings, Clark posted defensively against outrage over the killings and railed against calls for Gab to self-censor users. Clark also praised Bowers in a Gab post after the shootings, where he wrote, “f---ing k---- that got shot by the hero #RobertBowers were all active supporters of pedophilia… and every last one of them deserved exactly what happened to them and so much worse,” according to the FBI’s affidavit. That post was not available via the archive accessed by NBC News and a representative from the U.S. Attorney’s office declined to share a copy or say if they had one. Gab may have removed it before it could be captured by the archive. In one of his final posts, Clark "dared" Gab CEO Andrew Torba to ban him. Torba "can ban me if he wants but he knows as well as anyone else that banning me for this would take away any reason people still have to post here," Clark said.